Online casino wagering is very similar to betting on the Breeders Cup Classic, which may be the biggest thoroughbred horse race on the planet for horses that are three years and older. Only the Dubai World Cup has a larger purse than the $5 million given to the winner of the Classic, and this year’s race should be just as exciting as ever. Twirling Candy is thought to be the early favorite at 7/1 Breeders Cup Classic Odds, and he has seven wins in nine career starts, including wins in this year’s Grade 2 Strub Stakes and the Grade 2 Californian. He’ll race in the Grade 1 Hollywood Gold Cup this weekend at Hollywood Park, and if you’re planning on betting horses in November, you should check out the Gold Cup because Twirling Candy will go up against First Dude, who is listed at 20/1 with a group of other horses. He struggled in the Santa Anita Handicap, as did Twirling Candy, but those two are considered the top older horses in the world, and this week’s showdown could throw the Breeders Cup Classic odds for a loop. Crown Of Thorns is another horse that online betting players should be looking at, coming in at 12/1, and he came in second in the Breeders Cup Sprint in 2009. He’ll have to step up over the next few months as Crown Of Thorns has a pair of seventh-place finishes in his last three starts, and he’ll get his next opportunity at the Grade 2 San Diego Handicap at the end of the month. Speaking of poor results, Richard’s Kid comes in at 18/1, but he hasn’t finished inside the top 10 in his last two races. There is no word on when he’ll hit a track again, but Richard’s Kid needs a few good finishes in order to restore faith among players, and you don’t need to read BetOnline reviews to tell you a win is essential for him. A few horses that Triple Crown followers will be familiar with are in the mix as Dialed In is rated at 20/1, Nehro is listed at 25/1, and Preakness Stakes winner Shackleford comes in at 40/1. Dialed In skipped the Belmont Stakes after finishing fourth at the Preakness, while Nehro came in fourth at the Belmont after a runner-up position at the Kentucky Derby. Shackleford had an thrilling Triple Crown run, setting the pace in all three races, but he finished fourth in the Derby and fifth in the Belmont to go with his win at the Preakness. Shackleford has incredible sprint speed, but he tends to tire near the end of races over 1-1/4 miles, so consider that before making your sports betting picks. 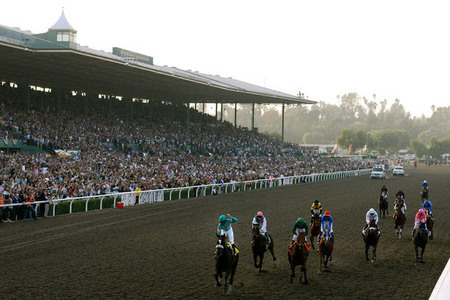 2011 Breeders Cup Classic Odds - Twirling Candy Early Favorite.